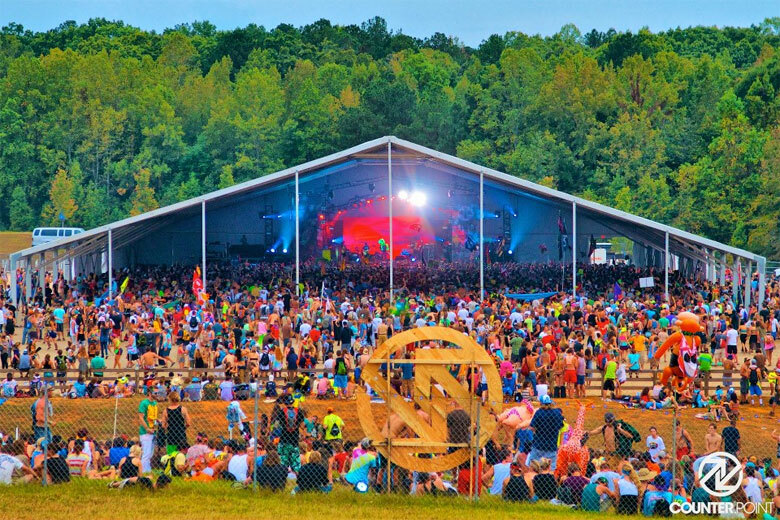 The first annual CounterPoint Music and Arts Festival was held about 20 miles South of Atlanta, GA on a well-established horse farm along the Chattahoochee river. The venue was nestled upon green-topped pastures and surrounded by woodlands and a scenic waterfront, altogether under a spacious sky. 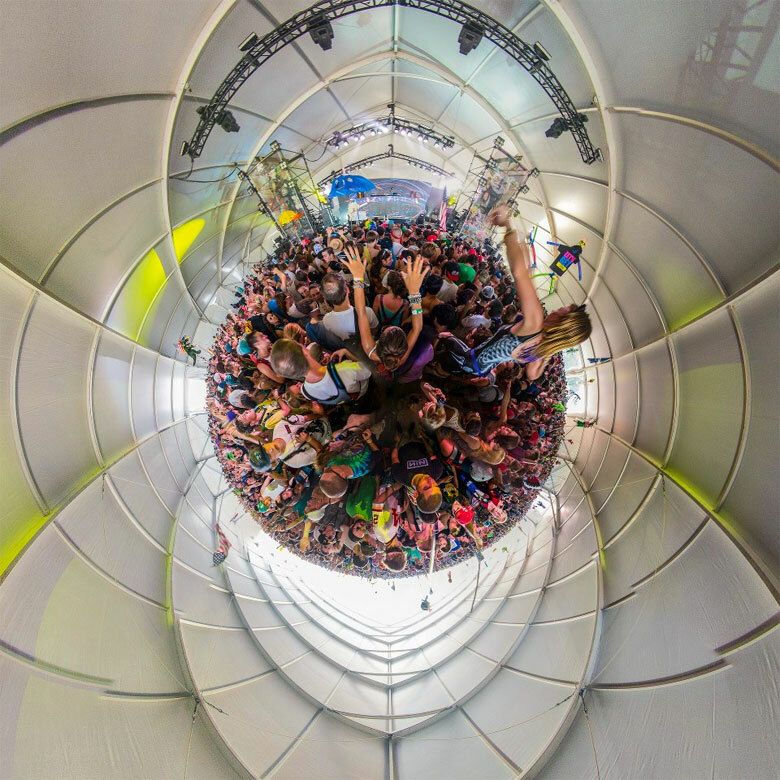 In the festival foreground stood a monstrous dual main stage for quick back-to-back set transitions. The mid-ground had carnival rides, live art installations, event sponsored amenities, and local goods and food vendors galore! (The jumbo turkey legs and lamb crepes were delicious!) Lastly, two whopping tents were situated in the background, along with a water-filling station that constantly had a line that seemed comparable to one for the latest iPhone release. 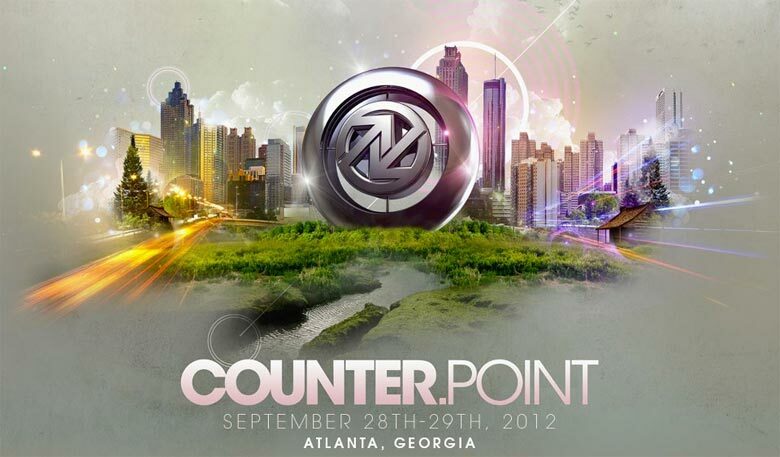 It seemed very appropriate for me, as a first-time festival camper, to attend the first ever CounterPoint! Festival goers not only brought their camping essentials, but more importantly, they brought an electrifying energy and all the feel-good vibes the east coast had to offer. Some even made the trek from California! I admired their dedication and gave them some well-earned candy bracelets. There was an undeniable multi-dimensional sense of community that was brought on by the shared love for connections with like-minded people, an escape from our daily realities, and above all, the love of music. I went in with no intentions of reviewing any specific acts, but instead I was going to attend as many sets as I could, well-known or otherwise, and would cover those that left a lasting impression. Those include Crystal Castles, Beats Antique, Skrillex, Zoogma, Adventure Club, and Abakus. A late addition to the 75-plus lineup, Abakus was the first to kick off the party in the beat tent. Russ Davies, professionally known as Abakus (and son of Ray Davies of The Kinks), wasted no time and immediately dropped his unique blend of ambient trance, dub, electro, and breakbeats to get the crowd moving. Walking in, my only impression of Abakus was from a cool ambient track the CounterPoint website sampled, called “Rocket”. Needless to say, my impression of respect developed instantly into a “this is really good’ liking. So like many, I found myself head nodding and shoulder swaying at the command of each beat. As the tent filled, the builds grew higher and the drops were laced with heavier bass sounds, which, as a moderate bass music enthusiast, I thoroughly enjoyed. A dubstep production duo hailing from Montreal, Christian Srigley and Leighton James formed Adventure Club in early 2011. Known for their ability to churn the innards of a track and let the raw wicked dub hang loose in intense dark emotions, Adventure Club, not surprisingly, have collected a staggering fan base in very little time. Quite possibly their most notable remix is “Crave You”, a disco influenced downtempo track by Flight Facilities. The beat tent was sprawling with handmade staffs topped with beloved characters like Pikachu and Mario to eerie elephant heads and fiesta cacti. With both arms reached high, the crowd signaled drops and rocked up and down as though worshipping and beckoning the flashing lights further. Though they’ve quickly matured and fallen into the dubstep niche, there’s no doubt Adventure Club will continue to experiment and evolve to find continued acclamation in EDM. Where do we begin with Beats Antique? This eclectic ensemble made up of David Satori, Zoe Jakes, and Tommy Cappel lived up to their enchanted reputation. Their musical style falls under numerous categories: not only electronica but also a union of Middle Eastern belly-dancing music, downtempo, hip-hop, jazz and more. I was standing near the speakers eager to pop my Beats Antique cherry and lust over Zoe Jakes. She appeared in tribal-like garbs and mesmerized the crowd with each pound of her drum. Later, in a white dress and oversized antlers with dangling chains; her body jutted and flowed like the waves after a wild rainstorm while Satori and Cappel strummed and drummed alongside. The performance more or less looked and felt like a mushroom-incepted fantasy filled with frolicking animal heads playing with an alien. All psychedelics aside, Beats Antique are mind-bending enough without them. Because of a severe rainstorm and temporary festival suspension mid-afternoon on day two, acts leading up to headliners were altered to fit the schedule. Unfortunately, Crystal Castles’ act was cut short and was also late to start! On a better note, the audience was ecstatic when they spotted vocalist Alice Glass’ purple hair and green army jacket get up and producer Ethan Kath behind the keyboard. This being my first time seeing Crystal Castles live, I was ready for the chaotic and thrashing performance that I’ve only had the pleasure of reading about. Glass’ stage presence was undeniable; her punk girl ‘don’t give a damn’ attitude flew through as she sang and flailed about on stage. At some point near the end, she was crowdsurfing and lit a joint, all while carelessly basking in the energy emitting from below her. I may or may not be a little obsessed with her. Okay, maybe more than a little. But I digress; categorizing Crystal Castles’ music style is like being in a graduate level analytical theory class. We could sit and attempt to pinpoint their sound — but the end result will be explicit but still inconclusive. Or maybe that’s just me. Nevertheless, I hope their ferociously skull-penetrating ear-digging musical ingenuity keeps evolving and continues to be pumped through speakers and into my ears. I was sitting with my campmate before the day’s festivities when our neighbor popped out of his tent. We began chatting about the weather, of all things, and who we were most eager to see. He mentioned a band called Zoogma that was scheduled to start off the main stage on day three. Zoogma is a four-piece electronic group from Oxford, Mississippi; their music is a blend between rock, jazz, hip hop and electronica. While performing renditions of popular songs like Big Poppa by Notorious B.I.G and Starry Eyed by Ellie Goulding, I specifically remember a fan on the guard rail relentlessly jumping and grooving to the music. With one on drums, another on keyboard and bass and the other two alternating between guitar and DJ, Zoogma put on a lively, beat driven, dance party performance. Sure he’s mainstream and is a commercial success. To say Skrillex has exploded in EDM is an understatement. He’s the grimy wobble, electro synth, hamster vocals dubstep sound that is so distinguished to his brand and has funneled into ear holes all around the world. Since I aimed to cover acts that left a lasting impression, he was unforgettable. Despite the thousands of fans screaming and busting out all sorts of weirdness before him, he remained characteristically humble and played a great show! I saw him live last summer at EDC (Electric Daisy Carnival) in Orlando but this time it was infinitely more centralized to his own originals and remixes. In addition to the raunchy dub drops that we expected from Skrillex, to our pleasant surprise, he incorporated a few funky moombahton-esque dub tunes in his set. Throughout the show, Skrillex wooed the crowd with hype and praise. In the finale, he climbed up on the turntable and lip-synced the vocals to “Scary Monsters and Nice Sprites” while gesturing to the audience to indicate that he is no different than the rest of us. Soon after, Ellie Goulding’s voice emanated from the speakers the ambient plucky lead of “Summit” and sends waves of laser lights into the sky. Music is intended to be heard and experienced live; feelings and emotions are best received as the artist intends. And boy did I get the tingles! This show was one of the most memorable thus far in my EDM enthusiast career, and I would not hesitate if given the chance to experience it again.